Your sense of hearing connects you to the people you love. When your hearing is intact, you can hear their questions, their concerns, and their words of love for you. An acute sense of hearing can also protect you from danger. Falling trees, cries of warning, and motors accelerating in your direction will all be heard. Despite the importance of our sense of hearing, both in our personal and professional lives, it is one of the senses that most of us take for granted. We punish our ears with loud noises at work and at home, and that ongoing noise pollution can lead to hearing losses that are hard to correct. This guide can help. We have collected information on how hearing works, how hearing loss happens within specific types of jobs, and what you can do to protect your hearing at home and at work. The human ear is a remarkable structure, made up of three separate parts that all contribute to our ability to hear. The exterior portion of the ear is shaped a bit like a funnel, with hard structures that point forward in the same direction as the eyes. This part of the ear is designed to capture sound waves as they move toward the front of the body. When those waves arrive, they move into the middle part of the ear. Here, there are three small bones that help to augment the sound. They move when exposed to sound, and they help the waves to travel even deeper into the body. 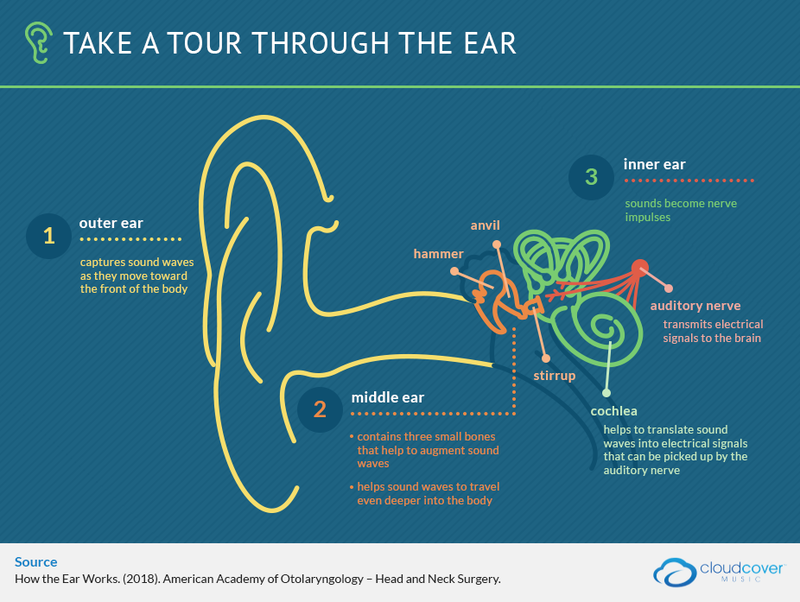 The inner ear is where sounds become nerve impulses, according to the American Academy of Otolaryngology – Head and Neck Surgery. A structure deep in the inner ear, known as the cochlea, helps to translate those sound waves into electrical signals that can be picked up by the auditory nerve. That nerve transmits the electrical signals to the brain. This process is complex, but it takes less than a second to complete. You may not notice any delay between an event happening and your ability to hear it. The process is the same whether the noise is loud or quiet, but the damage left behind can vary dramatically depending on the level of sound you are exposed to. Volume is measured in decibels (dB), and according to the National Institutes of Health (NIH), events that generate sounds of 75 dB or less are considered safe, even if you are exposed to them for a long period of time. A humming refrigerator or a normal conversation fall within this range, NIH says. Louder noises cause damage to delicate structures inside the cochlea. The cochlea is lined with very small hair-like structures, and those hairs bend when they are exposed to waves of sound. At the peak of the bend, channels within the hairs open up and chemicals rush in. That process creates the electrical signal the brain needs to register sound. Very loud sounds can damage the hairs inside the cochlea, and according to NIH, damaged cells do not grow back. When they are broken, damaged, or dead, they do not repair themselves. They are gone for good. Fewer hair cells means fewer electrical impulses moving into the brain, and that means sounds become harder to hear. When enough cells die off, people can develop measurable hearing loss. Hearing can also deteriorate with age. The hairs within the ear can thin with age, and the bones within the middle ear can stop moving as easily as they once did. Nerves can also slow down, which can mean some sound signals are dropped before they reach the hearing centers within the brain. This type of age-related hearing loss is also not curable. People with this type of hearing loss will not get better with therapy. Doctors have developed thresholds, so they can determine who can hear normally and who has a condition that impedes good hearing. According to the World Health Organization, people with normal hearing have sound thresholds of 25 dB in both ears. That means they can hear sounds as quiet as 25 dB. Someone who cannot hear at this level has hearing loss. Doctors test hearing acuity by playing a variety of different sounds through headphones, and asking patients to discuss what they can hear. These tests take just minutes to complete, and they provide doctors with a complete picture of what you can — and cannot — hear. Hearing loss is surprisingly common. According to NIH, about 15 percent of Americans 18 and older say they have some trouble hearing. This difficulty could be caused by various issues. Often, however, the hearing loss we experience is due to overexposure to noise. According to the Center for Hearing and Communication, noise is one of the leading causes of hearing loss. In addition, people with hearing loss wait for an average of seven years before they ask for help with their hearing, and only 16 percent of doctors perform routine hearing loss screening. These statistics seem to suggest that there are many of us living with hearing loss, although the majority of us with hearing difficulties are unaware of the issue or unwilling to ask for help. This could mean that our hearing losses will get worse, as we will not take steps to protect our hearing. The way people experience hearing loss can differ dramatically, depending on the type of loss they are living with. According to a researcher quoted in a piece produced for National Public Radio, people with age-related hearing loss may be unable to hear the consonants in the words people use when they are speaking. That can make the spoken word seem garbled. Others with noise-related hearing loss may be unable to hear some sounds at all while other sounds are so loud that they are painful. Distinguish one voice out of many. Hear people speaking in a crowded room. Understand dialogue in television shows and movies. Decipher what people say while whispering. Every moment that involves sound requires a little more interpretive effort, and according to the blog Living With Hearing Loss, written by someone with hearing loss, that interpretation is exhausting. This writer explains hearing loss as playing a constant game of fill in the blank. Each sound requires thought, so the listener can figure out what is there and what is missing. 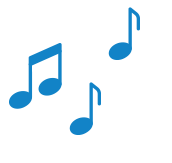 Another person with hearing loss, interviewed by Prevention, reports that people can become impatient when they are dealing with a person who has hearing loss. They may snap at recurrent requests to repeat what has been said, and that can force the person with hearing loss to simply attempt to make a guess about the conversation. Some people with hearing loss may avoid social situations altogether for fear of causing irritation or anger. A decline in hearing acuity is part of the aging process, which means all of us run the risk of losing at least some of our hearing with each passing year. There is very little we can do to prevent this type of hearing loss. Everyone who ages is at risk. But there are some types of hearing loss that are very preventable, and they are more common among specific types of people. Some of the daily habits we participate in could also contribute to hearing loss. For example, in a study published in the journal Noise and Health, researchers examined headphone use among 280 teenagers. They found that about 10 percent of these teens listened to music at 90 dB to 100 dB for long periods of time. Some teens even listened to music at this volume while they were sleeping. As we mentioned earlier, volumes at the 75-dB range and below were not associated with hearing damage. Louder volumes were. Playing music at 100 dB could certainly put these teens at risk for hearing loss. The work we do could also play a role. For example, the Hearing Health Foundation reports that 30 million workers in the United States are exposed to hazardous noise levels. This means some people work in jobs in which the noise is so loud and so constant that they damage their ears each and every day they go to work. If these workers do not take precautions to protect their hearing while they are at work, they may take home hearing loss in addition to a paycheck. *Not interested in the details? See our simple steps for prevention here or learn about high fidelity earplug options for musicians here. Musicians rely on an exceptional sense of hearing in order to excel in the work they do every day. Ironically, that work could impede their ability to perform the work they love. Consider this: The American Speech Language Hearing Association reports that a rock concert can produce noise at 112 dB. That is a volume the association considered extremely loud and dangerous to hearing. The association says that people attending a concert should wear earplugs to protect hearing. A person within the audience might experience this volume level for just a few hours on a rare occasion. But someone who is playing with that rock group could experience that level of noise multiple times during the same week while on tour. That same musician might also participate in ear-splitting sound checks before each concert just to make sure the room is properly set up for the festivities. People who participate in rock concerts like this over a long period of time can develop profound hearing loss. For example, Rolling Stone reports that AC/DC singer Brian Johnson was forced to leave in the midst of a tour due to profound hearing loss. It is not clear how this loss developed, but it is easy enough to assume that music played a part in this loss. This is a band known for loud concerts and raucous crowds. Both could have exposed the signer to very damaging sound waves over his long career. When the hearing loss was found, his doctors advised the signer to stop touring or risk complete deafness. 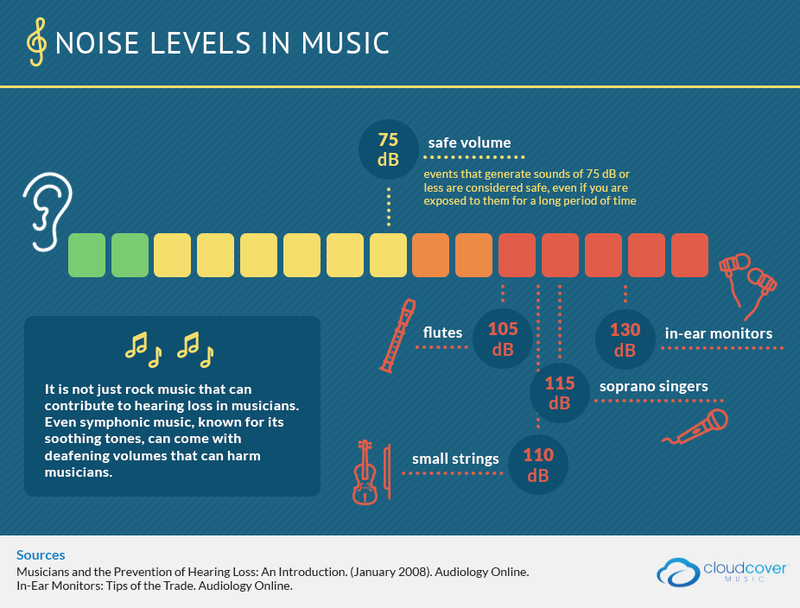 It is not just rock music that can contribute to hearing loss in musicians. Even symphonic music, known for its soothing tones, can come with deafening volumes that can harm musicians. That risk became clear in 2017, according to The Economist, when a violinist in London filed a lawsuit, claiming that he lives with hearing loss sustained after two rehearsals for a Wagner piece. In the lawsuit, the violinist claims that the noise around him reached 137 dB. In an article published in Audiology Online, researchers measured the dangers experienced by people playing various types of instruments, and they found that nearly no one was safe. Woodwinds: Brass players sitting behind them in an orchestra can harm hearing. Flutes: Neighbor flutes can reach more than 105 dB. String sections: Small strings can play at a volume louder than 110 dB, and they may also have brass instruments blaring behind them. Singers: Soprano singers can reach volumes of more than 115 dB. Amplified instruments, including guitars: Speakers and monitors to amplify sound can reach dangerous levels. In ensemble settings, musicians need to hear one another in order to keep the music playing. In traditional setups, musicians sit close to one another in order to hear complementary notes. In electronic settings, musicians use special speakers that point back at their feet. As the crowds get louder, musicians may turn up those monitors in order to hear their own notes. When one monitor grows louder, another musician might turn up another monitor in order to hear that person’s notes. It can become a game of warring speakers, with hearing as the loser. In-ear monitors were developed to help musicians hear the mix they need to hear without adding to the noise filling the room. They seemed like the perfect solution, but as Audiology Online points out, some in-ear monitors are capable of playing volumes of 130 dB. People who listen to this level of sound can struggle with permanent hearing loss. Musicians can work with audiologists, and they can be fitted with specialized equipment that allows them to hear what they need to hear without harming their ears. But musicians may be uncomfortable with using this protection. They felt the equipment hindered their musical performance. Protection made it hard for them to hear others. The equipment was uncomfortable, hard to use, or unsightly. Wearing protection made them look weak. Musicians who cannot hear the sounds around them can face difficult career choices. They may be forced to stop touring, so they will not be exposed to very loud stadiums. They may be asked to move into producer roles, so they can control the volume of the music as it plays. One thing they will not be able to do is fix the damage that has been done. As we mentioned, hearing loss caused by loud sounds cannot be corrected. People with this type of hearing loss can use hearing aids to amplify sound, but they cannot take a pill and see the problem magically disappear. On the surface, people who garden or farm do not have very much in common with people who perform in rock concerts. In reality, both of these groups of people are exposed to hazardous sounds at work, and both could develop profound hearing loss. Musicians have added protection, as they may be represented by unions or employers who are required to protect the hearing of their employees. Farmers are different. According to the U.S. Department of Agriculture, 97 percent of the farms in operation in the United States are family owned. That means farmers must take individual precautions to protect hearing. They may have many dangers to protect against. Farmers may be exposed to these triggers for hours each day, and in time, they may develop subtle signs of hearing loss, such as ringing in the ears. These early warning signs should prompt you to invest in hearing protection that you wear all day, every day. You can also invest in newer equipment that does not produce such loud sounds. People who work in construction build the roads, bridges, and highways that we rely on to get from place to place. They may also build the houses we live in and the offices we work in. Without this team of talented people, modern life wouldn’t exist. The work they do is vital. It is also incredibly noisy. Tearing down buildings, either by hand or with explosives, can produce sharp attacks of sound that can be devastating to the delicate structures within the ear. The tools people use within construction, such as jackhammers, drills, and nail guns, can also produce very loud sounds that can impede hearing. The Occupational Safety and Health Administration recommends measuring construction noise with a sound level meter, and making sure that you wear protective equipment to keep your ears safe. But when you can’t use a meter, the administration says, you can use the 2-to-3-foot rule. If you have to raise your voice for someone 2-to-3 feet away from you to hear you, the area is probably at or above 85 dB. Moving away from the source of the noise, or containing the noise with a temporary sound barrier, may be wise. What is the best way to ensure that someone hears what you have to say? Small children often answer this question with volume. The louder they speak, the more likely it might be that others will pay attention to the message they are trying to convey. Put several children in a room, such as a daycare center or classroom, and noise levels can rise rapidly. 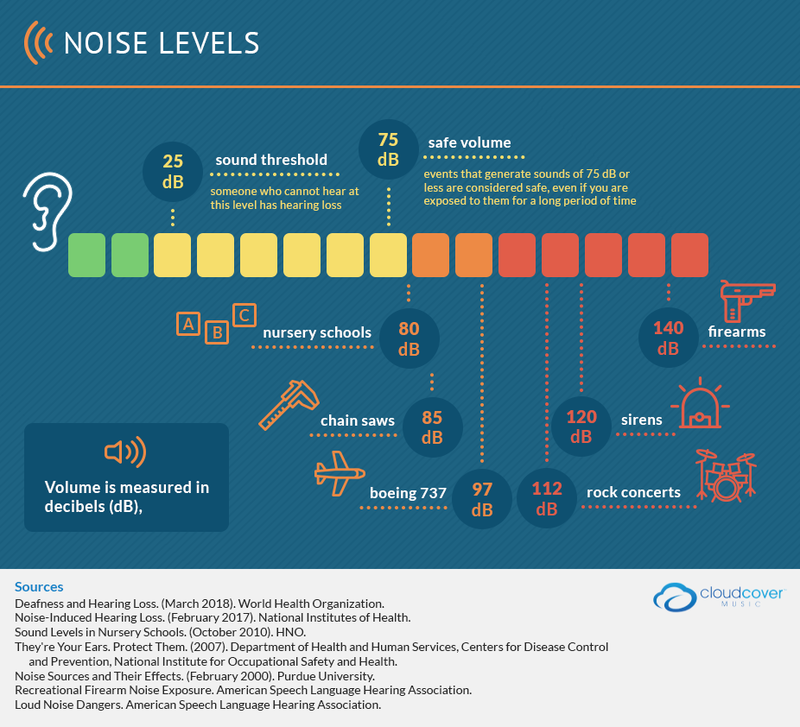 In a study published in the journal HNO, researchers found that noise levels in nursery schools can average 80 dB, and they can reach peak levels of 112.55 dB. 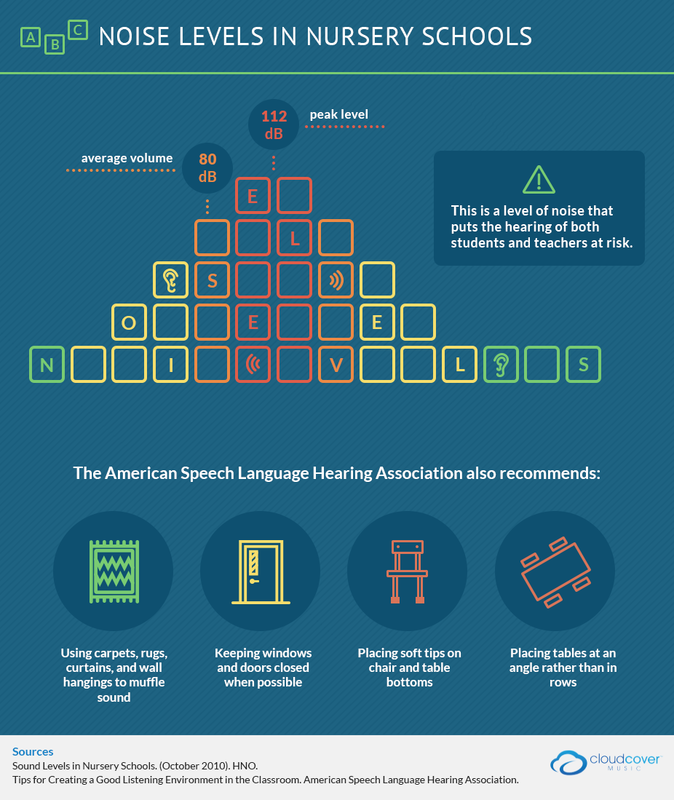 This is a level of noise that puts the hearing of both students and teachers at risk. Children enter these environments to learn, and teachers can teach lessons about volume control and hearing loss. Those lessons could help children to protect their own hearing, and it could help teachers to create a safer environment in which to spend the day. Using carpets, rugs, curtains, and wall hangings to muffle sound. Keeping windows and doors closed when possible. Placing soft tips on chair and table bottoms. Placing tables at an angle rather than in rows. When an emergency happens, first responders help us to recover. Often, they need to use sirens to clear traffic, so they can get to an emergency situation as it unfolds. According to NIH, a siren’s volume can reach 120 dB. Someone who drives a vehicle with a siren blaring could be exposed to that noise for long periods every day. Once first responders arrive on the scene, they may be exposed to even more loud sounds. For example, people in the midst of a medical emergency or people frightened about what is happening to them may scream. The Guinness World Record for the loudest scream goes to a woman in England who had a scream measured at 129 dB. That is a sound that can cause hearing damage. Firearms might also be part of the experience for first responders. Police may encounter people who are shooting at them, or they may be required to shoot their own guns. The American Speech Language Hearing Association reports that almost all firearms produce noises that are louder than 140 dB. That is a noise level associated with permanent hearing damage. First responders may not be able to wear headphones or earplugs during the entirety of their shifts. You need to communicate with the people around you, and that means you must have acute hearing. But you can work with your union representatives to ensure that you have access to protection during some of the loudest portions of your workdays, and you can demand appropriate rest breaks, so you can give your ears a break from relentless noise. Factories are where the goods and products we use each day are made. Parts are stamped from hard metal, delicate pieces are welded together, segments roll down assembly lines, and workers stand guard to make sure everything runs according to plan. Factories tend to be big, cavernous spaces. The equipment that clogs up these spaces can be incredibly loud. That means the average person who works in a factory is exposed to a great deal of noise that hits many reflective surfaces. Each bounce can amplify the noise. 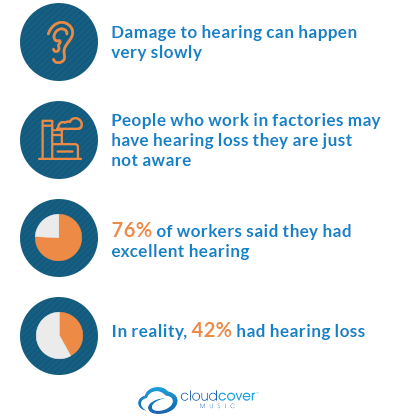 Damage to hearing can happen very slowly, and that means many people who work in factories may have hearing loss they are just not aware of. For example, in a study of factory workers published in the journal Noise and Health, researchers found that 76 percent of workers said they had excellent hearing, but in reality, 42 percent had hearing loss. The modern factory environment is different than the factory floors of years past. As The Seattle Times points out, most factory jobs are considered skilled positions in which workers are required to understand computer programming and technical specifications. Working in a job like this might mean sitting in a booth next to a machine rather than standing next to a clanging machine for eight hours per day. Even so, a factory job might not be safe for your ears, especially if you take off your hearing protection on a regular basis to talk with friends or coworkers. The best way to stay safe in a job like this is to wear protection all day long, and to use your breaks to retreat to a quiet space to let your ears rest. In order to help a plane push past the draw of gravity and lift into the air, the work of many engines is required. Each engine can produce an amazing amount of noise, and the people who work in the aviation industry may be exposed to this spectacular noise on a regular basis. For example, Purdue University reports that a jet takeoff, when experienced at 25 meters, can reach 150 dB, which is enough to rupture an eardrum. A Boeing 737 at one nautical mile before landing, on the other hand, can reach a sound level of 97 dB. People who work on the ground of an airport or military base absolutely must wear hearing protection; otherwise, they will not be able to complete this work. But they are not the only ones who need to worry about the impact of aircraft sound. The Federal Aviation Administration reports that people inside of aircraft can experience noise caused by the equipment that helps the plane to fly, such as propellers and rotors, and the equipment that keeps the plane comfortable and safe, such as alert systems and pressurization systems. Pilots may experience so much noise that they must yell to one another to be heard, and flight crew walking into the cabin may be exposed to the same level of sound. Wearing earplugs, earmuffs, communication headsets, or a combination of all of these devices can help keep people on the ground and in the air safe from the damage noise can cause. A restaurant is a place where people come together to share a meal and catch up on conversation. It is not surprising then that restaurants are exceedingly noisy spaces. In the Los Angeles Times, a reporter moved through several restaurants with a noise meter and claims that rooms registered between 87 dB and 90.3 dB. These are levels associated with hearing loss, and people who work in these environments may be exposed to these levels throughout their entire shift. Restaurants weren’t always so noisy. As an author writing for Vox points out, restaurants became much louder in the 1990s when a New York chef began pumping very loud music into the dining room to create a sense of excitement and bustle for customers. It was a trend that caught on, and now, it seems unusual to walk into a dining establishment that is quiet. But customers may not appreciate the din, and that gives the staff the opportunity to open up a conversation about noise. Perhaps a trial night of lower volumes could help to inspire owners to turn down the sound dial a bit. If that doesn’t work, staffers can consult with their union representatives and ask about noise protections. Those who work in the military endure some of the most punishing noise levels available. They may fly in transport planes that do not muffle engine noise, they may fire guns or rockets, and they may endure ongoing yelling from staffers or civilians. It is no wonder that the Hearing Health Foundation estimates that three in five returning military service members come home with hearing loss. The military has equipment available that can protect the hearing of those who serve. Some helmets come with noise protections, and some soldiers are given special mufflers to wear when they are shooting handguns and rifles. Wearing this gear is not a sign of weakness. It is mandatory for those who want to return to civilian life with hearing intact. The job you hold can play a big role in your ability to hear, and some of the risks you face at work are not easily corrected. But your ears face other challenges during a typical day, and amending those challenges could be a key step to take to protect and preserve your hearing. According to the Better Hearing Institute, a full one-third of permanent hearing loss is preventable, but it requires diligence and planning. These are a few steps you can take. 1. Pay attention to headphone volume. Headphones put the source of the sound very close to your ears, and that makes them quite dangerous. The National Health Service recommends listening to music at 60 percent of the device’s maximum volume. Some devices allow you to preset them so you cannot make them any louder. 2. Get accurate sound data. The CDC offers a sound level meter app you can use to determine just how loud a noise really is. Downloading that app and using it often can help you understand whether you should be using protection in any new environment you walk into. Sounds can seem quieter the farther you move from them. If you feel as though a sound is too loud, try moving away from it or walking into another room. 4. Keep protection close at hand. The CDC recommends keeping earplugs and other sound-blocking devices in your purse, pockets, and car. When sounds are too loud and you feel yourself yelling to be heard, it is time to use those protective devices. Protecting your hearing is vital, but it might also seem a little unusual. Your friends and family members may notice that you are wearing earplugs, steering clear of noisy environments, and otherwise working to protect your ears. Be open with them about your concerns, and share what you’re doing to preserve your hearing. You may be able to convince them to do the same. Hearing aids help to amplify sounds, and they can be good tools for those who have hearing loss. For some people, the right hearing aid can open up worlds of experience they thought they had lost for good. People with hearing loss also appreciate sensitivity and adjustments from those around them. If you are living or working with someone who has hearing loss, these tips from the Hearing Loss Association of America may be helpful. Ask how you can make yourself easier to hear. Would turning off a fan or a radio help? Keep your face in the light in case the person needs to read your lips. Don’t cover your mouth with your hands, and don’t chew anything while you’re talking. Speak clearly, but resist the urge to shout. If you are struggling to make a specific word understood, look for a way to rephrase the sentence using different words. Above all, be patient. It can be frustrating for both sides when communication is difficult. Approaching the issue with compassion can help to keep the spirit of cooperation alive. At Cloud Cover Music, we don’t make protective devices that can protect your ears. We don’t make hearing aids. Instead, we make it possible for businesses to play the music you want to hear in their offices, salons, restaurants, and other communal spaces. We want you to be able to hear the music we play, and we want to ensure that artists can hear themselves, so they will keep making the music you want to hear. We hope this guide has been useful, as you look for ways to protect your hearing. And if you’re looking for a partner to smooth the process of playing music in public, we’d love to talk with you. Please contact us. We’d like to thank Lily Scott from Digital Advocates for getting in touch and asking us to share this article on preventing hearing loss. All content is the intellectual property of Cloud Cover Media. The original article and all footnotes and references can be viewed here.